Part case study, part manifesto, this groundbreaking book by John Toussaint, MD and Roger Gerard, PhD uses real-life anecdotes and the logic of lean thinking to make a convincing argument that a revolutionary new kind of healthcare–lean healthcare–is urgently needed and eminently doable. How lean techniques of value-stream-mapping and rapid improvement events cut the average “door-to-balloon time for heart attack patients at two hospitals from 90 minutes to 37 minutes. What ThedaCare leaders did to replace medicine’s “shame and blame” culture with a lean culture based on continuous improvement and respect for people. How the lean principle of “building in quality at the source” broke down divisions among medical specialties allowing teams to develop patient care plans faster. How the plan-do-study-act cycle coupled with rapid improvement events cut the wait time at a robotic radiosurgery unit from 26 days to 6 days. How senior leaders at other healthcare organizations can begin their own lean transformations using a nine-step action plan based on what ThedaCare did–and what it would do differently. Toussaint and Gerard prove that lean healthcare does not mean less care. On the Mend shows that when care is truly re-designed around patients, waste, and errors are eliminated, quality improves, costs come down, and healthcare professionals have more time to spend with patients, who get even better care. On the Mend was a great introduction to the world of efficiency and quality in healthcare, with all its ups and downs. It was well written, the story was engaging – easily accessible to someone not a medical insider and would also be very accessible to someone unfamiliar with business process analysis (in this case, lean). Jargon was avoided and concepts were explained briefly but well. Loved the process maps at the end. An inspiring journey! Who knew health care reform could be uplifting? I couldn’t wait for this book to come out as I was somewhat familiar with the ThedaCare story through articles and other media outlets. Rather than wait for the book to be shipped, I downloaded it using the Kindle for PC option. I devoured this book in a few hours, however I will be studying it for many more. I was most impressed with the ThedaCare team’s demonstration of two key principles of lean – Respect for People and Humility! This book should open the eyes of healthcare leaders and politicians alike in seeing the possibilities of lean (Continuous Improvement) in lowering costs in healthcare, while improving quality of care, patient satisfaction and employee engagement. I appreciated the honesty in admitting past mistakes and the candor used in how those mistakes were corrected. For example, one of the many key points made in Chapter 5 – Continuous Improvement, while speaking of past attempts at improvement, “In the end, we saw the enemy of our improvement efforts and it was us…Improvements ended when the project was over because nobody was in charge of sustaining change and measuring results.” “Looking back at the best of the failed improvement programs, there are two repeating themes: empowering staff-the doctors, nurses, and managers actually doing the work – and measuring results. Without a method, these necessary attributes are nearly impossible to hard-wire into the daily habits of staff. Continuous improvement is that method.” This observation demonstrated to me that the leadership at ThedaCare had been through the hard work and had learned that there are no shortcuts to improving. It is time for the rest of us in Healthcare to step up and be the change we all want to see and not wait for change to happen to us. Congratulations and thanks to John, Roger and the rest of the the Thedacare team for being the pioneers and sharing their experience with the rest of us. 1- I am sure some so-called “Lean Expert” will say that the book is not a “technical” illustration of lean. I happen to believe that the greatness of On the Mend lies in the fact that it is not technical. Rather, it is a practical illustration of how an organization can realize gains from using few tools, and at the same time, utilize the best capital it already has: the experience and involvement of the organization’s own people. 2- I think this is the first book on lean that fully addresses clinical areas with real examples i.e. STEMI, Stroke, primary clinic and laboratory. Most lean books talk about supply chain, sterilization areas and process related to production. 3- The introduction touched on Toyota’s recent problems (page 3) and explained that this is a reminder of the consequences of failing to adhere to lean principles. I believe that the problems that Toyota faced, and the subsequent actions taken by the company, provide us with better examples as to why we need lean. When I am asked about this issue (which is almost every day), I reply by asking the person: “Do you remember what Toyota did first after the problems became public knowledge?” Most say that Toyota acknowledged the problem. I remind them that one of the first actions that Toyota took was to stop producing cars. Toyota asked its 137,000 employees to stop producing cars until a new process is designed and put in place to repair current defects and ensure that the new cars do not have the same defect. My argument proceeds to ask, “Are we in healthcare ready to close the OR, pharmacy or lab if we discover that errors (I have been using the term error instead of defect because most healthcare workers will say we handle people not machines) have been committed?” Also, I usually mention that Virginia Mason in Seattle did in fact close their OR after a sentinel event back in 2004. In the future, I will mention the example you used in the book about the action that Kathryn Correia took to shut down the unit’s surgical suites. However, these examples, in my opinion, tend to show that even if we become a lean organization, we will still make mistakes but we will try to correct them the right way. 4- I loved the collaborative care example. Currently, we are re-designing our admission/discharge processes and I am lobbying to use the ThedaCare model. 5- The way the book illustrated the practice of time stamped activities by the minute is a powerful illustration of the importance of time not only from a financial aspect but from a quality of care and clinical outcomes point of view. 6- The emphasis on sustainability is very powerful and interesting as most lean initiatives tend to falter after a period of time. You are right in saying it is “the biggest challenge” as skeptics will say “we told you lean does not work.” 7- I loved the argument that “Lean can’t be delegated.” Many of the senior managers I have met and work with emphasize that the lean team needs to provide results. Your argument asks senior managers to be directly involved in all aspects of lean. 8- Changing the culture of senior leadership and physicians is the hardest aspect of implementing a full lean method and way of thinking. 9- I think Dr. Toussaint should pattern your phrase “lean is brain, waiting is waste.” It is such a nice way of saying lean is common sense that pays off. 10- I have a question about the 5-day RIEs. Having conducted many of them, I found them to be helpful but also very difficult to conduct. In the past, I have conducted a 1-day, 3-day and 5-day RBEs. How can we remove some of the obstacles related to RBEs, especially in regards to the 5-day model? 11- It is nice that Dr. Toussaint highlighted the importance of having former patients/families in RBEs and learning from their point of view. We have done that, and experienced similar positive results. 12- “Shame and blame” — how true. There is a phrase that I always use during training/ workshops/discussions: “blame the process, support the people.” Your example of the surgeon with post surgical infection is a perfect example. 13- I understood the logic and I always advocate for decisions to be made after a complete review involving front line staff and adequate data, but sometimes we need to use the “autocratic decision model.” For example, our SCIP measurements were mediocre. We did process improvement activities with process maps and created hard stops to ensure higher compliances, but we were faced with one surgeon that refused to comply. The only course of action we were left with was to ask the Executive Medical Committee to warn the surgeon to either comply or have his privileges suspended. In the end, he did comply which served as a message to other surgeons. As a result, our SCIP outcomes improved tremendously. 14- Your explanation about the importance of data through the surgeon and infection rate is superb and should convince most skeptics. 15- Standard work for managers/senior leaders is very challenging but extremely beneficial. I will try to introduce it to our senior leaders. 16- Seeing a manager/supervisor as a coach instead of a judge is an excellent concept. 17- In addition to the explanation about the “roots of autocracy,” I would like to add an example of an explanation that was given to me about 25 years ago by a highly regarded oncologist, Dr. Charlene Holt, who opened the first cancer institute in the United Arab Emirates and also was the Chief of Oncology at Madigan Military Hospital at Tacoma, Washington. When I worked with her as a medical interpreter/translator, I asked her why doctors are so “single-minded.” She answered that “we are trained as individuals, not as a team. We are exclusively responsible for the diagnosis, treatment and follow-up of our patients. If anything happens, whether it’s good or bad, is our responsibility.” This is still as powerful as the first time I heard it. 18- With data, one can make a convincing argument — especially with physicians. I am not sure if you are aware of Dr. Krishna’s work in cardiovascular surgery at Rochester, New York. After process walks, evaluation and VSM, he developed a standardized set-up (instruments and implants) for every procedure. The data showed tremendous improvements in clinical outcomes and financial gains. He used the phrase “my way or the highway” with some surgeons and some physicians left (similar to ThedaCare’s experience). 19- The danger of data is also very true and is widely mentioned in Carol Boston-Fleischhauer’s article in the Journal of Nursing Administration, “Enhancing Healthcare Process Design with Human Factors Engineering and Reliability Science.” Carol talked about “Reliability Science” and argues that data can be misleading without using the “Reliability Design Method.” 20- I loved the upstream, middle flow and downstream analogy. 21- Finally, I loved the fact that link lean activities are not linked to budget issues but rather to patient/staff/physician/safety, clinical outcomes and overall satisfaction. On the Mend is clear without being technical…honest without being dismal…and hopeful without being sappy. This is a guide….a set of storys…a set of lessons… organized in a very readable and understandable approach that people inside or outside healthcare can learn from. With all the angst and noise about healthcare reform… this will help give many a baseline for understanding and many others a way forward for action. While I am not a Lean Healthcare professional per say I am a Lean professional that has worked in various aspects of healthcare. My experience varies from the patient floor, to the ER and OR, to long term care, to psychiatric ward and a few things in between. Most of my family are healthcare professionals of some kind and I have been on both sides of care. So when I had the opportunity to review On the Mend I jumped on it. 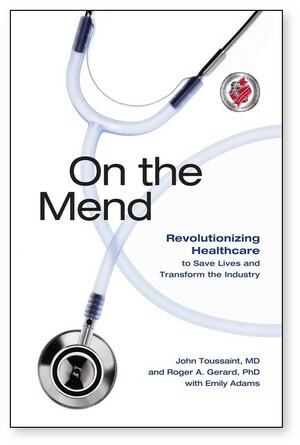 On the Mend, authors John Toussaint, MD and Roger A. Gerard, PhD, is about the seven year Lean healthcare journey of the author’s medical system, Thedacare. After some false starts with trying to improve clinical performance they went outside healthcare for an improvement strategy. They studied the manufacturing industry and found Lean. The Lean principles they learned had to be adapted to healthcare. The first part of the book is about defining the principles that make up the lean healthcare process. In summary they are: Focus on patients and design care around them. Identify value for patient and get rid of everything else (waste). Minimize time to treatment and through its course. Continuous improvement of work practices every day in every area. The principles are presented with real life medical examples from the authors’ Lean journey. This creates a compelling reason to adapt these principles. For instance, they relate the loss of time in healthcare to the loss of muscle, loss of brain, or even loss of life. The second half of the book focuses on the people aspect of Lean healthcare. John and Roger introduce the leadership skills needed in a lean environment, how to engage Doctors in the process, how to create the problem solver culture, and how to develop future lean healthcare leaders. The examples in this section are more personal in nature as you might expect. I particularly liked Roger’s “communities of practice” where he describes the five stages of change: initiation, reality, resistance, compromise, and integration. The book ends with a nine step action plan for starting lean initiatives in healthcare. Based on the authors experience they recommend: 1. Identify the crisis. What is the platform for change? 2. Create a Lean promotion office. Critical for planning and managing change. 3. Find change agents. They will help lean take root in your organization. 4. Map your value streams. Understand the true patient experience. 5. Engage senior leaders early in strategy deployment. Improvements must be focused on what is important. 6. Acquire and disperse knowledge broadly. Learning and applying knowledge is necessary for everyone. 7. Teach a man to fish (or, become a mentor). You need to create the leaders you want. 8. Involve suppliers in Lean. Invite them to join in improvements and develop partnerships. 9. Restructure your organization into product families. Design value from patients’ perspective. They conclude with this advice: Don’t let anything stop you. Trust the improvement process. The real-life examples of patients’ experiences with the Lean system make the book particularly compelling. The book has a plan that can be used to guide other healthcare organizations to sustainable improvement. They further prove this can be done without compromising the patient care; on the contrary it is improved. The book is short, non-technical, and can easily be read in one day. However, due to the subtle attention to detail you will find yourself re-reading it to truly get the most out of it. I definitely recommend this book to healthcare professionals and those practitioners associated with either the quality or upper management functions. This outlines the “Healthcare Reform” that is truly needed in the industry to better serve the patient, cut costs, and minimize waste. This should be required reading in medical schools, and for Healthcare management. Well I recently read ’On the Mend’. Absolutely fantastic! The best “lean healthcare” book I have ever read. I had worked with 6 or so hospitals and healthcare systems to implement continuous improvement initiatives as far back as 1990. How I wish I had this book in hand when I was battling with doctors and administrative staffs in the 1990s, and all but giving up by 2000. It brilliantly addresses the many issues I encountered when trying to apply common sense continuous improvement concepts in healthcare, or even getting doctors and key administrators to show up for CI events. What we could have achieved over the past 15-20 years if we just had a voice in the industry like John and Roger during that time, and a reference like “On the Mend”. With John Toussaint’s credibility as a doctor and CEO, and the proven application of the concepts at Thedacare, it will do wonders to open people’s eyes to the opportunities that exist throughout the industry. Further, it is written in a language that the industry can truly understand. I consider this a “must read” even for experienced lean practitioners in manufacturing, as it will provide them with a deeper understanding of the concepts. “On The Mend” by John Toussaint, Roger Gerard, and Emily Adams is highly recommended for any level of leader in a hospital. The authors stress the importance of how leaders need to change themselves in a Lean transformation. Insights to the thinking of leaders at ThedaCare will challenge a hospital’s current management approach and hopefully inspire experimentation of a new style. Woven throughout the book is the continual discussion of the impacts of a shame and blame culture. The authors discuss some of the root causes of shame and blame. They explain some of the counter-measures they used to improve the culture. There is a whole chapter on engaging doctors that is of value for any healthcare leader. The book greatly shows how time reduction is not only a productivity metric, but how timeliness impacts the health and safety of the patient. Other examples throughout the book demonstrate that Lean can make great improvements in a hospital. I appreciate the credibility of the authors. Many times, they state when things did not work well, how they were the problem in some cases, and how they would approach differently in the future. I think it is important for these sort of books to be honest since a Lean journey is not easy. “On The Mend” provides a realistic look at how this kind of thinking can make lasting transformation in hospitals. More information about the book including videos, author interviews, and a free chapter available at the Lean Enterprise Institute website. Disclosure: A review copy of this book was provided to me by the publisher. Very informative, easy to understand! I read this on Kindle for PC and the application was very easy to use. This is one of those books that is hard to put down and I never thought I could say that about a business book. Very well written and keeps the reader interested. Recommended to wife as she moves into a managerial role. Wife read and agrees it is a good book for anyone in Healthcare industry. On the Mend makes perfect sense! This book helps us understand the significant problems in health care and ways to focus more clearly on creating value for customers through studying delivery systems and acting on the insights gained. It shows us how to keep employees engaged and truly gain from that higher level engagement. This requires hands-on leadership and a collaborative, courageous model of leadership. This is an easy read and yet thoroughly introduces the reality of the management challenge in transforming an organisation via a lean approach. I recommend it to any leader, in any industry, contemplating or already on such a transformative journey. For those in health care, it is a real gift. Prior to reading this book, I had a very negative outlook on lean within a healthcare setting. This book was highly informational thought a few key points were glossed over. It at least gives me hope that it is possible to improve health care quality! I think this is a must read for every nurse, physician and surgeon! We need to learn what hospitals are doing to change the way healthcare is delivered! I read this book as part of my MBA. I am in the construction industry but found the concept of lean Management fascinating. I was very impressed by the process and the steps taken to evaluate the system and the aspect of involving everyone in the process. On the Mend is an excellent and very interesting book about the application of Lean manufacturing theory to healthcare performance improvement. It is extremely well-written, containing great examples of changes, measurements, and follow-through mindset required to successfully implement change. The appendices contain forms and tables which provide excellent tools for tracking and guiding process improvements. The book provides great examples for how to apply the LEAN concept to a hospital setting. Even if you are a different type of health care provider, I think it helps one see how a different way of looking at Value can help us re-imagine care delivery in any setting. Lots of useful nuggets of information. Good reading for any healthcare organisation desiring to go on a continuous improvement program. Reflects the reality of most healthcare organizations and identifies the must have elements that will insure a certain success. Even while proving that it can work, they still have some ways to go to reach all sectors of operations, proving that resistance to change is most certainly a worthy factor to consider.